Every Game. Every Sport. Every Channel. Did you know that there are 50,000 games playing on more 8,000 TV stations every year? That’s a lot of games to keep track of, and fumbling through clunky on-screen guides and flipping through newspapers is cumbersome. The SportsTV Guide makes it so you and your staff are never again stumped by a guest asking if they can watch a specific game, team, or sport. We list every game playing every day on a Guide custom to your location and program providers. Don’t fumble through clunky on-screen TV schedules or newspapers again. Use the SportsTV Guide to quickly and easily find the games you want to show in a blink of an eye. Don’t drown in the thousands of sporting events playing on thousands of TV stations! The SportsTV Guide lists everything you want to show in an easy to read format. Your guests have questions. You’ll have the answers. The SportsTV Guide ensures your staff always know what games you can show, on what channel and at what time. With the SportsTV Guide, we make it easier for you to know what’s on for sports. Not only can you easily find out what events are broadcasting today and tomorrow, but you can also look ahead in the schedule to see what games are playing later this week or even later in the month. You’ll never have to tell a guest you’re not sure if you can show a game or waste time scrambling to find what station the game’s on. With the SportsTV Guide, you’ll always know what games are on, at what times, and on which stations. We turn you and your staff into the sports experts. Now you have the power to really plan your programming ahead of time, letting your staff worry about the guest experience and less on what to show. The SportsTV Guide makes planning and marketing sporting event promotions a snap. See what events you can show and let your guests know ahead of time! Can You Show the Game? Can You Put the Game On? Only care about football? Baseball? Soccer? Hockey? Maybe your guests are more into watersports, cricket and equestrian. No longer do you have to thumb your way through every single channel to find the event you and your guests care about. No more defaulting to re-runs of ESPN SportsCenter. The SportsTV Guide not only tells you what’s on for the major sports, but also gives you listings for amazing alternate content, too! We list everything from pro sports, international matches, PPV events, Internet-only streams, college sports, high school games, obscure sports and more! 50+ sports in all! A link to your SportsTV Guide is emailed to your inbox daily. No need for you and your staff to memorize yet another password. Simply click the link in your daily email and you’re brought to your Guide, custom to your location and program providers. The best part? The SportsTV Guide works on all device type, operating systems and browsers. View it on your laptop in the back office, or have it loaded on your bar’s tablet for easy reference behind the bar. You can also print your custom SportsTV Guide in a super easy-to-read format. It’s perfect for quick reference for your staff. Stash a printed copy of your Guide behind the bar, at the hostess stand, at your entertainment station. Any place where you often change the TV stations to show the games. You can even print out copies to be put at every table or bar seat, so your guests know what games you can show! Stash Your SportsTV Guide Where It'll Help the Most! View the games playing today, tomorrow, or up to a week ahead. View your Guide by Time, or filter by Sport. A link to your custom Guide is sent to your inbox everyday. No memorizing another log-in info. Get custom TV listings based on your location and program providers. Pick your favorite teams from any league, so it always appears in bold and at the top of your Guide. Print a clean copy of your custom Guide for easy access away from your devices. Works on every device type and OS, so you can view your Guide anywhere. Displays the channels for up to two of your program providers. If it’s a sport, it’s on the SportsTV Guide. Everything from pro to college & high school to PPV & Internet-only streams. Filter out channels from your Guide you’re not interested in. Type in a team name for lightning fast reference. 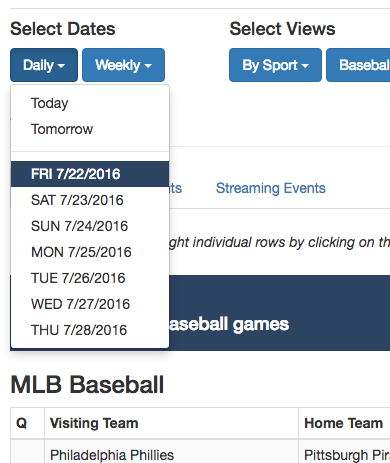 Use the SportsTV Guide widget to embed your guide on your website, so your guests know what games you can show. The SportsTV Guide Widget lets you embed what games you can show right onto your website. It’s perfect for promoting sporting events with your guests. Embed the widget on your website and promote the feature to your guests via your newsletters and social media followers. And it’s as simple as copying and pasting just a few lines of code. Use the default settings for quick and easy embedding, or customize the CSS to seamlessly match your venue’s website.